Obverse: Lareate head of Vespasian right. Text around IMP CAES VESPASIAN AVG P M TR P P P COS VIII. Reverse: Salus seated left on ornate stool, holding patera in extended right hand and long sceptre in left hand. Text around SALVS AVGVSTA, S C in exergue. History: Salus was the goddess of health and was worshipped as one of the greatest deities by the Romans. 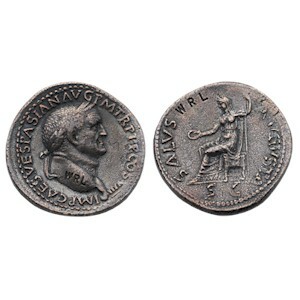 Her depiction on the reverse of the coin refers to the health of the Emperor and indicates that Vespasian was labouring at the time under some disease. Indeed Vespasian died after reigning for nearly 10 years on June 23 AD79 of an intestinal inflammation, which led to excessive diarrhea.